Imagine a bowl of fresh apricot slices swimming in sweet vanilla cream! These TRIPLE SCENTED tea lights are hand poured with a really nice PURE SOY wax which means a fragrant, cleaner and longer burn. 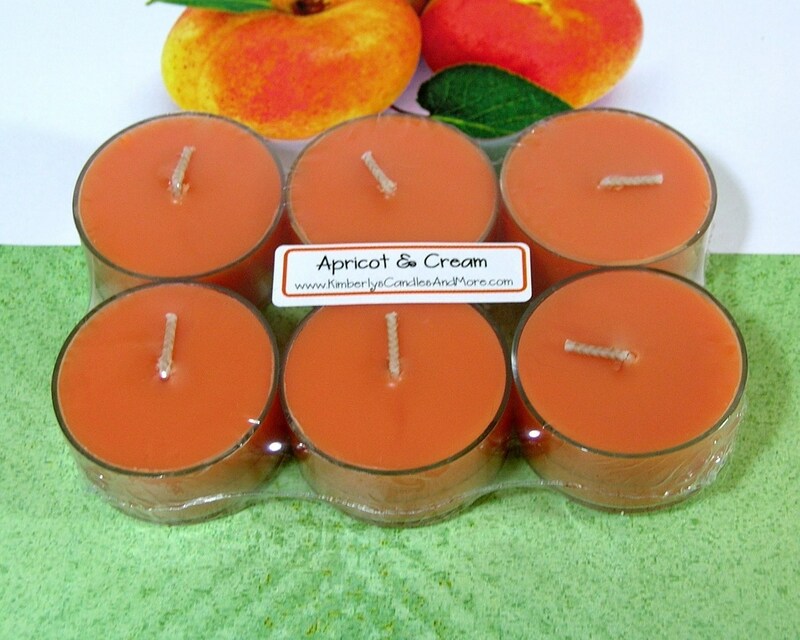 These wonderfully scented small candles will last at about 6 hours each. These tea lights would be great using with a non-electric tart melt warmer. Order the coordinating fragrances for both tea lights and tart melts and get even more of the aroma you love! My COTTON wicks are self trimming therefore wick trimming is kept to a minimum. You will receive SIX (6) tea lights packaged in shrink wrap. SHIPPING INFORMATION: The shipping prices you see is only an estimate. If the actual cost is more than 1.00 off, I will gladly refund you the difference. If I didn't charge enough, then I'll pay the extra. You will not pay anymore then what is listed! My Soy Waxes: *Are 100% vegetable, made with Pure Soybean oil, GUARANTEED! *Are all NATURAL and biodegradable. *Are NOT tested on animals. *Contain NO palm wax. *Contain NO petroleum, paraffin or beeswax products. *Contain NO toxic materials. *Contain NO Genetically Modified Material. *Containers are easily cleaned with soap and water after the entire candle has been burned. *Is made using soy beans from U.S. farms only! When you purchase our candles and tart melts, you are supporting countless farmers across the country.